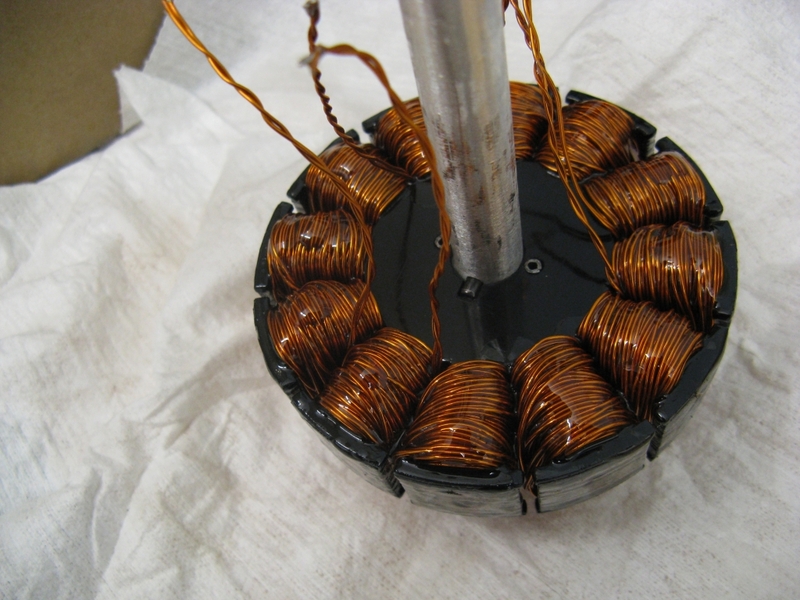 It's a "distributed LRK" winding, but split into two half-motors [AabBCc] and [aABbcC] on opposite sides of the stator. 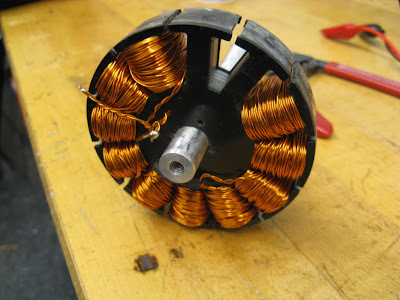 Connecting the two half-motors in parallel and running wires out through the center shaft completes the winding of the stator. Next, a part that wasn't really on the "large tasks" list but is still fairly important: the motor end cap. Since the end cap is not part of the load path from wheel to deck, it wasn't as critical as the wheel adapter. 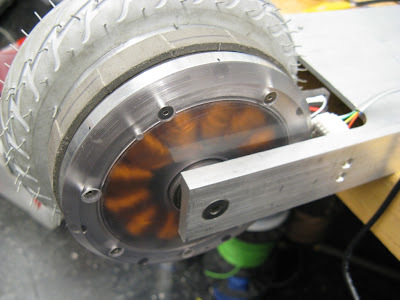 And the motor would spin fine without it thanks to the two wheel bearings. 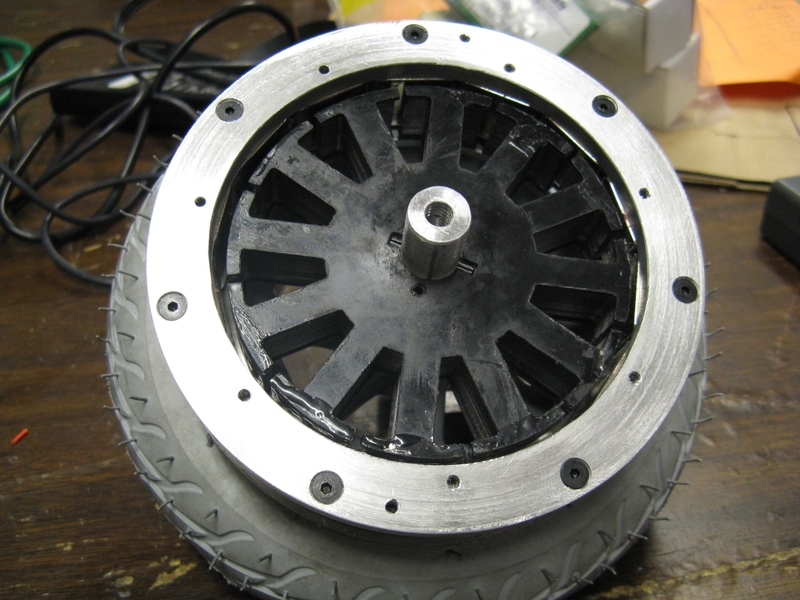 But I thought it would be good to just get it done so that the motor itself is a completed unit. Nuts have six sides. 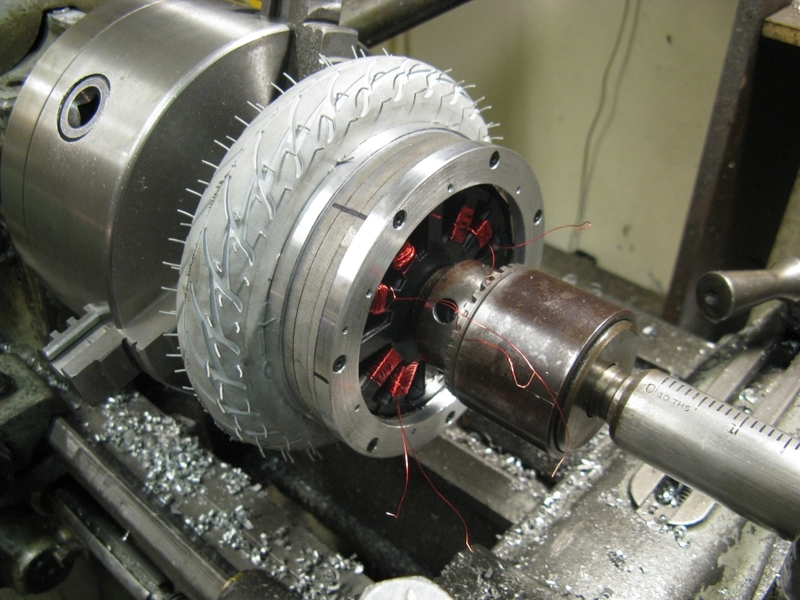 Lathes have three jaws. Commence happiness. 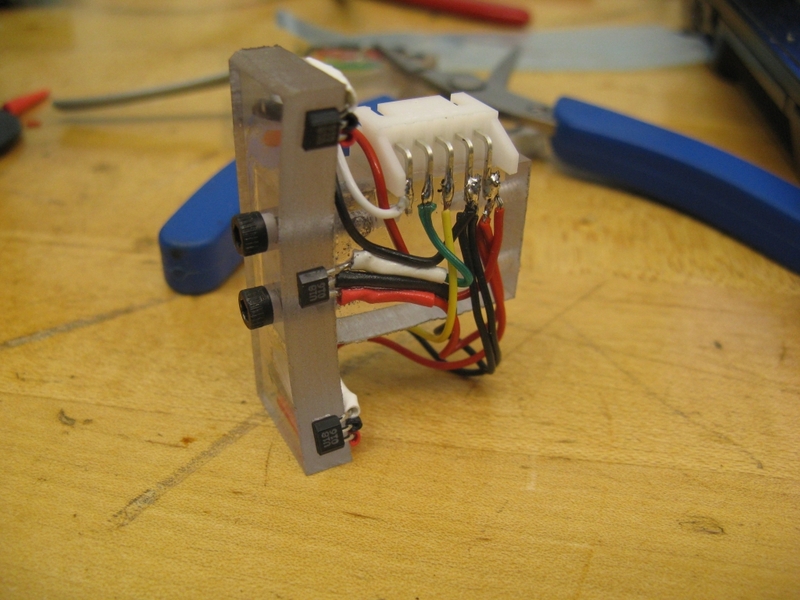 BWD used external Hall effect sensors, mostly because we didn't know any better. 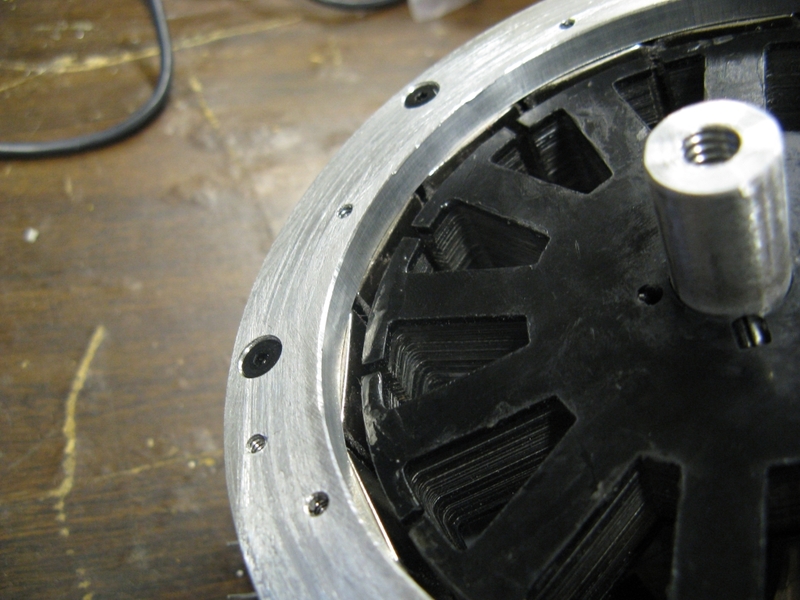 But they actually turned out to work very well, picking up the fringing field from the huge, overhanging rotor magnets through the polycarbonate end caps. 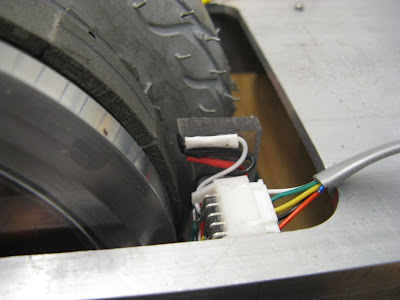 This time, though, the magnets don't overhang very far and the field on the outside of the rotor is not enough to reliably trip the sensors. Somewhere on this train of thought I was browsing on McMaster and stumbled on P/N 3651K4, a flexible magnet strip that's sort-of like an industrial refrigerator magnet. 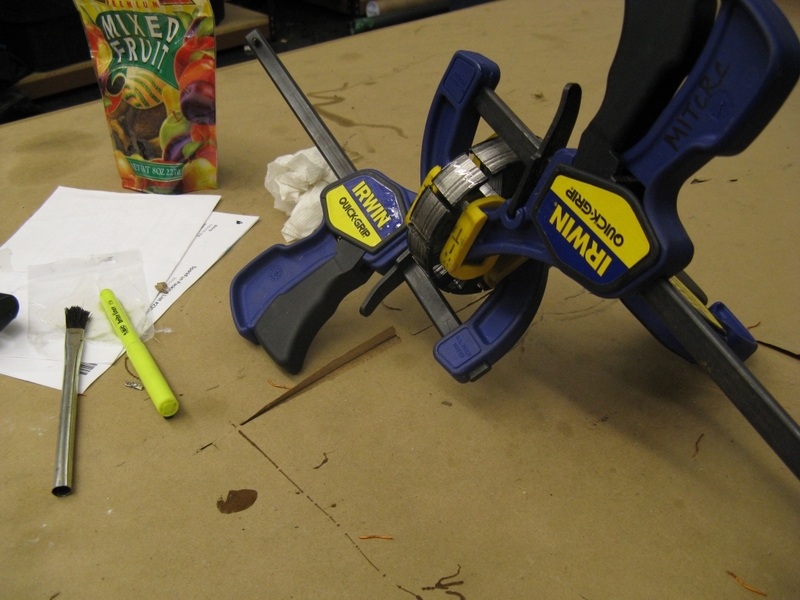 I wound up just cutting this strip into 14 equally-spaced pieces and gluing them to the outside of the rotor can. Total elapsed time for thinking of this idea, ordering magnets, thinking it is probably a bad idea, doing it anyway, and finding out that it works fine: three days. Yes, it will pick up metal junk from the ground. But so did BWD. It's good for cleaning the shop floor / finding small hardware. It also happened so fast that I didn't have time to second-guess it. 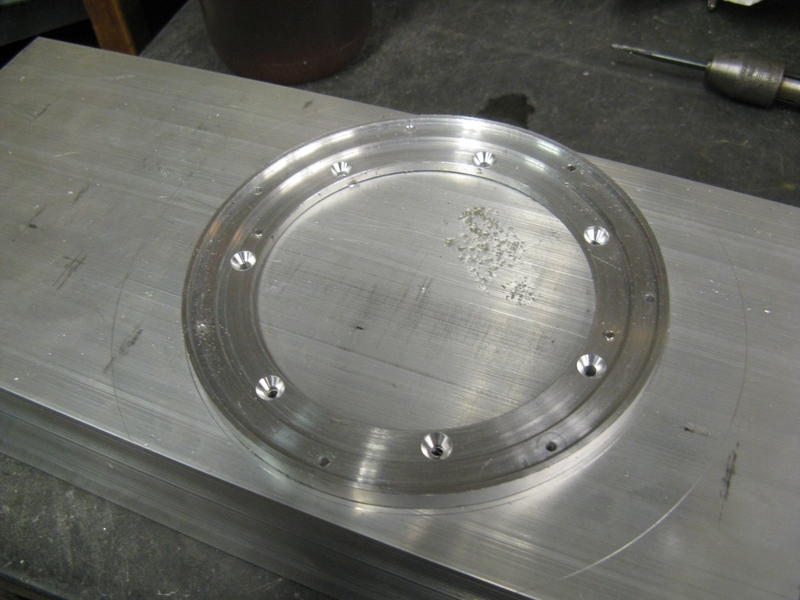 The surface is courtesy of a 5" boring cutter, which is probably the most dangerous thing I've ever stuck in a mill. The sensor spacing is 17.1º, which is 360º/7/3. (Seven pole pairs per revolution, three sensors per pole pair.) This board mounts to the inside of the rear fork, with a small gap between the sense magnet strip and the Hall effect sensors. 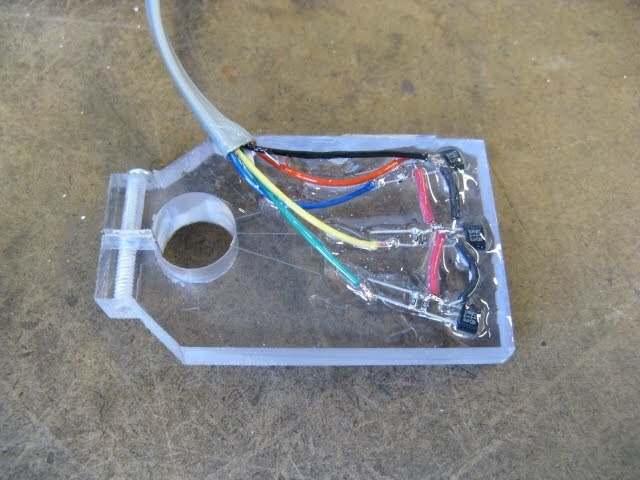 The sensor cable from the controller plugs right in to the connector on the sensor board. This is the painful step. Actually, it wasn't too bad. Extensive lathomometer testing with a test winding of 40 turns per tooth predicted a back EMF constant of 0.190 V/(rad/s) under sinusoidal control. In RC terms, that's Kv = 50.3 rpm/V. 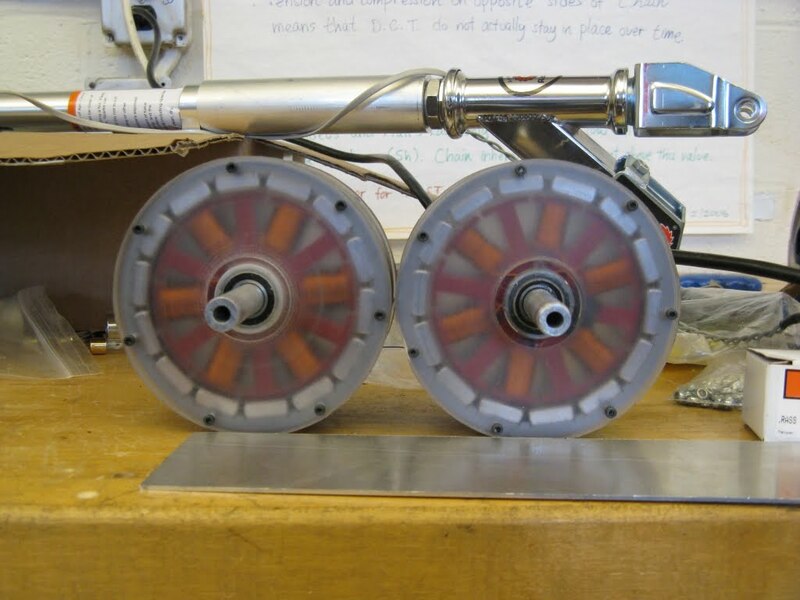 This would give a no-load ground speed of almost 30mph at 33V. That's a bit fast, but in the right ballpark. There's really no such thing as a no-load ground speed, so in reality the top speed will be lower. But still, I decided to trade a bit of speed back for more torque by planning for 45 turns per tooth. Interestingly, this makes it identical in turn count to BWD's rear motor. Since they have identical 2D geometry and per-phase turn counts, the only difference is the stator stack length: 0.875" for BWD and 0.625" for this motor. 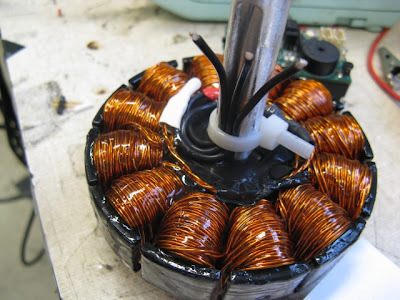 Shorter stator means a lower back EMF constant (or a higher Kv). BWD's back EMF constant was for six-step commutation, not sinusoidal, but should still give a reasonable estimate. 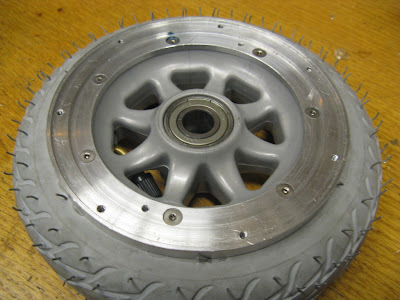 From this, Pneu Scooter's motor would come out at around 0.214 V/(rad/s), or Kv = 44.6 rpm/V. The last set is blocked in from both sides, so it was the hardest to fit, but ultimately it worked. The plastic end laminations do a great job of protecting the windings from the edges of the teeth, but the inside surface of the top of each tooth is relatively unguarded and a likely place for shorts. I found at least one, but luckily it went away with some shoving of wires away from the tooth top. Ideally, I would have epoxy coated the tooth tips ahead of time. But, as it is, I'll live with encasing the entire thing in epoxy while nothing's shorted. We didn't do this on BWD and I kinda don't like it in general. It's a bit too permanent for me. 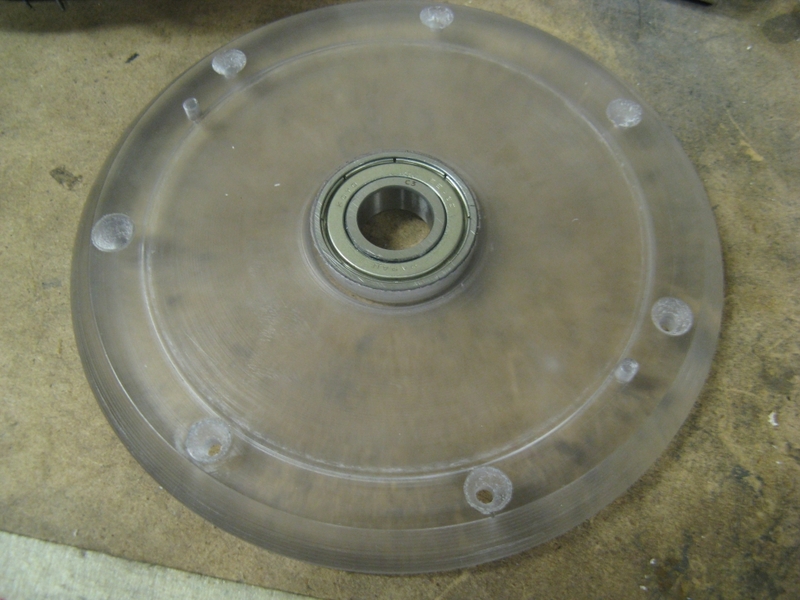 But it should offer more protection against vibration and shock knocking the windings around. It might also help with heat transfer to the core. 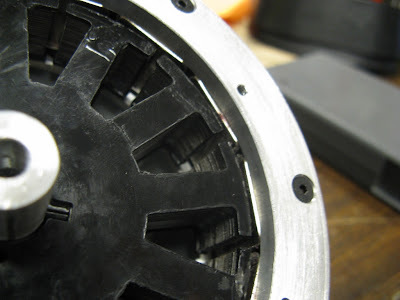 Or it might permanently encase a mistake that will cause me to have to re-do the entire stator. We'll find out in a few days! 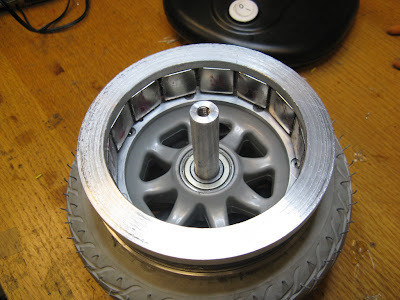 The reason I identify this as the most critical part is because, against my better instincts, I am relying on the plastic wheel hub as an integral part of the motor's structural loop. It takes the place of what would normally be a carefully machined aluminum or polycarbonate side wall, and I have to live with both its relative elasticity and its imperfect geometry. 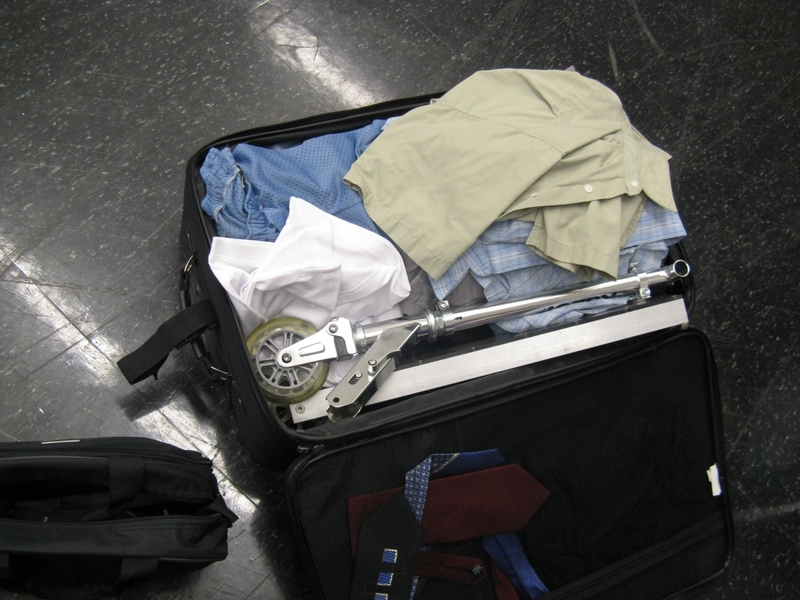 The good news is that it has very nice bearing pockets already and a flat, thick rim. The aluminum part in focus reinforces the rim and aligns the rotor so that it's concentric with the bearing pockets in the wheel hub. The outer rotor spacer (right) has one less "step" than the rim adapter (left) because it clears the stator entirely, which is good because it means I can drop the stator in and spin it without actually removing any of the parts that hold the rotor to the wheel, something I'll get to later. But first, lots and lots of bolt holes. 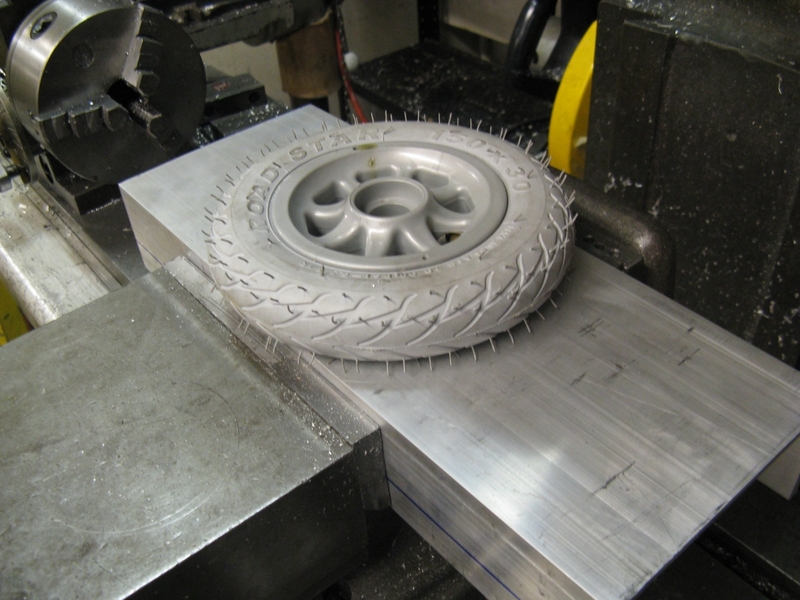 First, in the wheel itself. I made a multipurpose mill fixture out of the leftover scooter deck u-channel. 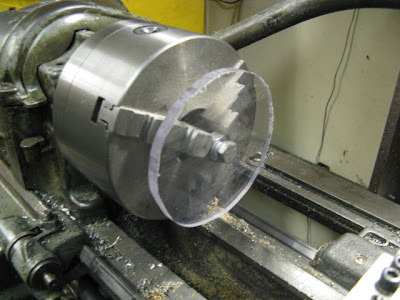 The part to be machined is screwed into the u-channel from below. 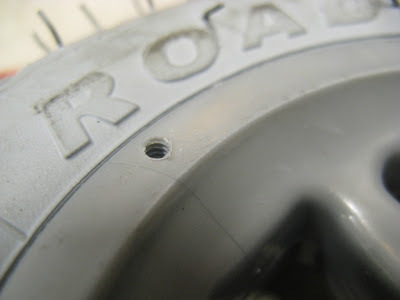 Here, the wheel gets a pattern of seven 4-40 tapped holes, centered on the bearing pocket's ID. 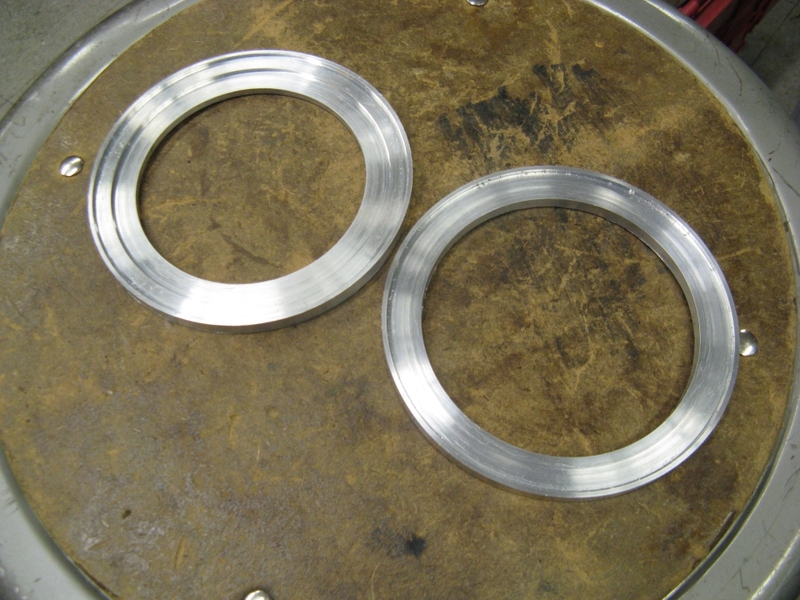 The thick rim allowed several full threads, which is good. 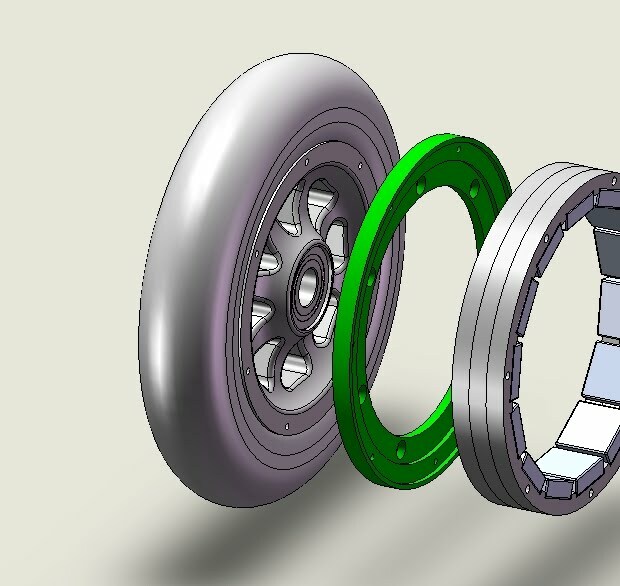 The rim adapter actually isn't in the load path from the tire to the shaft; that load goes straight into the two wheel bearings. 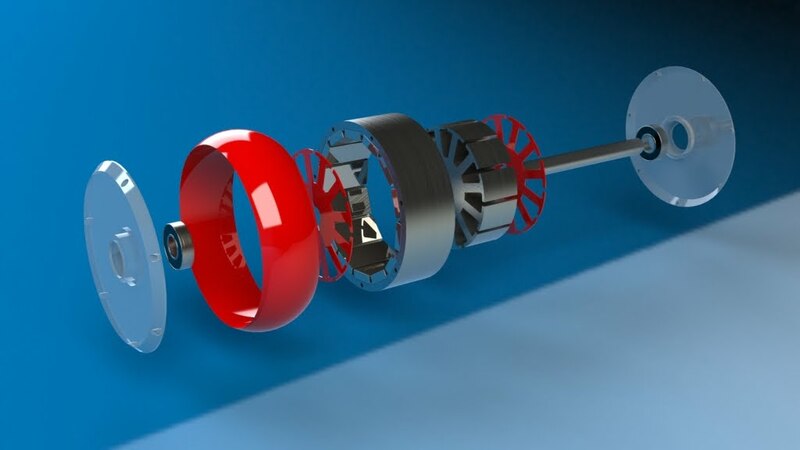 Instead, this part is only responsible for aligning and holding the rotor in place over the stator, which is fixed to the shaft that passes through the wheel bearings. So, I'm not worried about the 4-40's getting ripped out of the plastic or anything. I'm more worried about concentricity and bolt pattern alignment. The wheel hub itself is not perfect, though, and the stator stack is very skewed, as I'll mention later, so I probably didn't have to obsess about this part as much as I did. But whatever, it's still cool. After the satisfying snap of the stator being sucked in by the magnets, I was very pleased to find that it did in fact spin freely with no outside bearing. 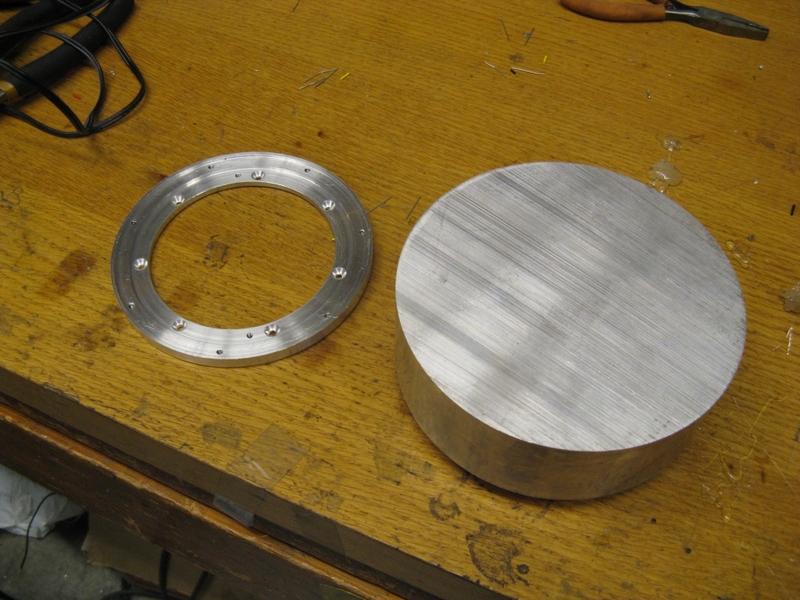 I'll still add the outside plate and bearing for weatherproofing, but this gives me confidence that the plate is non-structural (or at most semi-structural...) and can be made thinner to accommodate more windings if necessary. The stack must have been poorly fixtured during the gluing phase. It's not quite as bad as it looks, since the inner layers of laminations have almost the opposite skew. But there is still a net asymmetry that has me worried, and unfortunately I am just a few laminations short of being able to produce another stack. I think it will still work, since BWD's extra-thick magnet design is supposed to absorb exactly these kinds of manufacturing errors. I know! 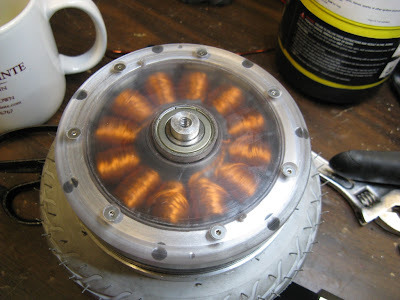 Since the motor is well-supported without the outside bearing, I have temporary direct access to the stator... Why not put on a test winding? 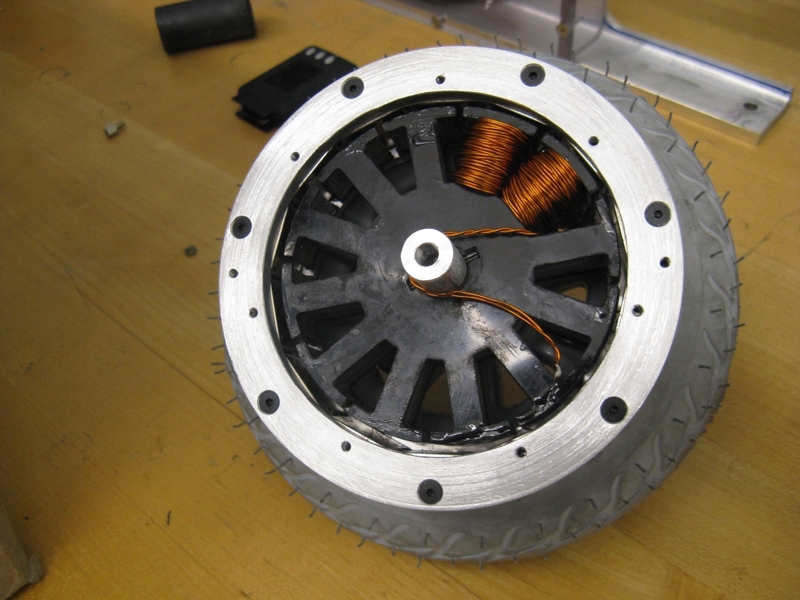 The result was only about a 5% difference in generated voltage due to the skewed stator. The projected torque constant is pretty much on target at 0.191Nm/A for the narrow gap side and 0.183Nm/A for the wide gap side. Wiring the two opposing sides in parallel will create some current flow and I²R loss because of the different constants. But, taking into account the operating voltage and estimated resistance, this should be a small (<1W) power drain at worst. So, I should stop worrying and just wind it already.